One early morning, I took to the town’s streets on my own, careful not to slide down Saint-Emilion’s infamous tertres or steep cobbled lanes (better to do so before a glass of wine!). 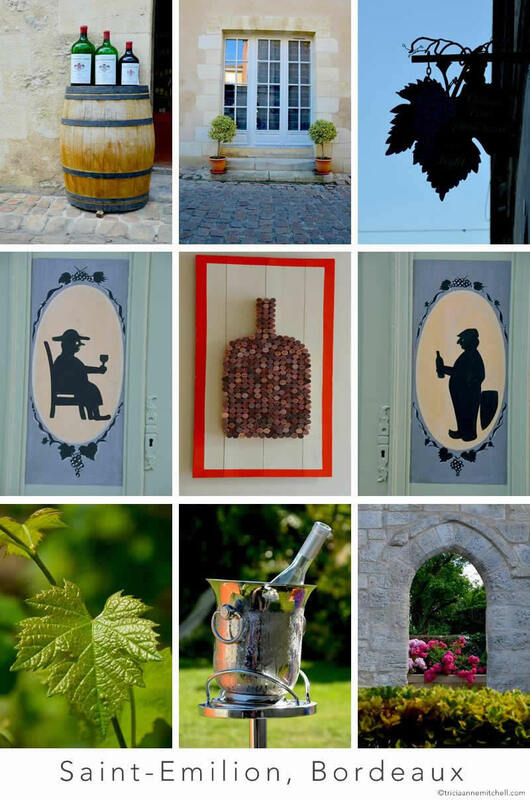 On the walk, I soaked up the details you see here: a pair of topiaries, the silhouette of a sign shaped like a grape leaf, and my favorite – the likeness of a bottle fashioned out of corks, beautifully tinted by Bordeaux’s famed wine. Helen, thanks for sharing your experience. I must confess that we also didn’t do any formal wine tastings, though we did get to sample some of the region’s impressive red wine, and even a Rosé from Provence. We didn’t make it to the city of Bordeaux – did you stay there overnight, and if so, what did you think? When we were planning our trip (along with Shawn’s parents who pampered us that weekend), we were contemplating whether to spend most of our time in Bordeaux or in a village. In the end, of course, we opted to stay in Saint-Émilion the entire weekend. When the schedule allows, we like slow travel like that. Caroline, I’m happy to hear that the post reminded you of your time in Bordeaux! We’ve been fortunate to have visited a fair number of different ‘wine country’ throughout the world, but there’s something extra special about Saint-Émilion / Bordeaux, with Burgundy not far behind. Shawn and I didn’t formally visit any wineries in Saint-Émilion, but we enjoyed some memorable bottles of wine – poolside and at dinner. When were you there? Its truly a wonderful weekend when you have time to appreciate even the smallest details. Looks like you had a great morning walk! Lovely to hear from you. I could envision you creating something like the cork wine bottle featured in the center of the collage. When we get settled again, it would be a fun project to tackle, though it will involve enjoying many bottles of wine. I suppose that’s half the fun :) Enjoy the weekend! It is our Thanksgiving weekend. We will be Thanksgiving dinner with family and friends. My dear brother is cooking the turkey. I am contributing sweet potato mousse and pumpkin pies. My the feasting begin!! Virginia, here’s hoping you had a lovely day. Shawn’s parents, who hail from Canada, were also celebrating on Sunday. We got as close as we could to turkey in this part of the world (chicken breast and sauerkraut). Since high school, I’ve had dreams of spending an extended amount of time in France someday – where in the country did you live? I appreciate the pointer about Vallon Pont d’Arc too. From the French Alps, to the beaches, and wine country, I love the diversity France has to offer. How does the Bordeaux wine you have tasted compare to those from other parts of France? Bespoke Traveler, I used to make regular pilgrimages to wine country in France’s Alsace region, so I remember that wine pretty well, but don’t have vivid memories from Burgundian wineries or those in Champagne – probably because I wasn’t taking in-depth travel notes at the time! The Bordeaux wine was phenomenal though – some of the best we’ve ever had. It helps that we also had good company to share it with (Shawn’s parents), which always enhances an experience. When Shawn and I went to Burgundy, we met a Frenchman purely by chance as we were admiring a vintage Citroën in front of his grandmother’s home. He invited us in to that home, which he was restoring, to share a 1982 Cabernet. What hospitality and history he’d share with us that afternoon. And the wine was also quite good. I would love to do a thorough trip through France and this I must add. It’s always interesting how towns and villages take on a certain character and personality which reflects in all their exterior decor. A toast to you and Shawn. Like you, I’d love to do a slow travel kind of road-trip through France. When I lived and worked in Germany, I was fortunate to make some pretty regular weekend jaunts there, but the ability to drive on quiet lanes through the countryside without rushing back home to work on Monday sounds delightful. I’ve been a bit of a francophile ever since I studied French in high school, and it’s been a longtime dream to live there for a life chapter someday. Hope you and Ron are well and enjoying your Sunday afternoon!